Hackers are launching a campaign against the promotion of hatred and racism online, and one of their main targets is the Ku Klux Klan (KKK). Over the course of the last couple months, websites belonging to the KKK flicked off and on, members of the hate group have had their identities posted online, and their recruiting efforts have been attacked. This has been the work of several hacker collectives, including Anonymous and BinarySec, under a loosely-coordinated operation they’re calling #OpKKK. “The average American likely believes hate groups like the KKK are all but dead and gone, restricted now to a handful of secret enclaves consisting of a few dying old racist men,” said a hacker with BinarySec, who goes by the name Zombie Ghost, in an interview on Twitter. “But, part of OpKKK is bringing attention to the fact that these groups are not dead and are in fact finding a new life online,” he said. A perusal of the #OpKKK tag on Twitter shows the campaign has been very active. On April 19, a hacker took down the Confederate White Knights of the KKK recruiting page on Facebook, and another hacker said they’re planning to release information on KKK members and has been hacking their online accounts. On April 14, another hacker took down the website of the United Northern and Southern Knights of the Ku Klux Klan, although the site was back online on April 19. They had also taken down the main site, kkk.com, on March 29, but the site is also online again. The main type of cyberattack they’re using against the sites is a distributed denial of service (DDoS) attack. It works by overloading a website with fake traffic, which makes the sites inaccessible. Using this method, hackers sometimes keep the sites offline for days or weeks. The United Northern and Southern Knights of the Ku Klux Klan published a statement on their site, claiming its goal to “unite White Christians through the bond of brotherhood and aid their awareness of the problems facing our country.” They claim to be a non-violent, patriotic, law-abiding organization. According to the Southern Poverty Law Center, the KKK has a “long history of violence” and is the oldest and most infamous American hate group. It notes that while black Americans are the main target of the group, it targets people of various ethnicities and beliefs—and has recently even begun targeting Catholics. “Over the years since it was formed in December 1865, the Klan has typically seen itself as a Christian organization, although in modern times Klan groups are motivated by a variety of theological and political ideologies,” it states. Zombie Ghost said that while “it has been a long time since the KKK felt comfortable enough to burn crosses on peoples lawns and hang people from trees,” their ideologies haven’t changed and the KKK still poses a threat to the groups it targets. According to a report from the Simon Wiesenthal Center, many online hate groups try to target young people for recruitment on the Internet—and teens and preteens tend to be more easily affected by their ideologies. It states “some adolescents appear to take Internet content at face value,” and notes that close to a quarter of teens admitted they’ve been exposed to hate sites. The #OpKKK hacker campaign to shut down hate sites has been going on since at least November 2014, but ran into problems in October 2015. 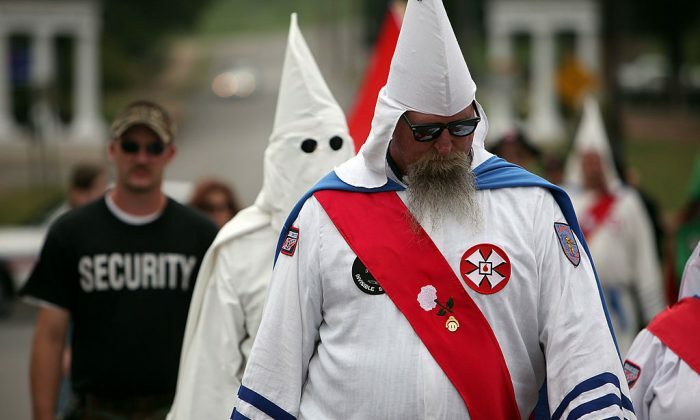 MirrorUK reported that hackers with Anonymous had published the names of 1,000 alleged KKK members. A rogue former member of Anonymous, however, added additional names to the list who were innocent—including some politicians. The hackers recently restarted the campaign, and while they are again looking to name and shame KKK members, they plan on doing so with a higher level of scrutiny. An investigative report from the BBC exposed a Russian disinformation attempt that could have been straight out of the Cold War.